Franklin resident Pam McDonald has always turned to writing as a way to express herself. Although she has been writing all her life, she just published her first book and is excited to share it with the world. McDonald, who just published her first book, “Windy Garden” said the book is an expression of her imagination over the years and stories that had been captured in her diaries growing up. “Windy Garden” is set in a picturesque small town, cradled by the breathtakingly beautiful mountains of Western North Carolina. It’s a place to take in the sweet smell of the apple orchards covering the hillsides; a place to experience the vivid, fiery colors of autumn; a place to greet each day by watching the sun rise over the lush mountaintops. This is the town for home-cooked food, and old-fashioned fun. But is it a place for someone new? Newcomer Bonnie McDaniel learns the hard way that fitting in is never easy. She encounters Lucy, the friendly server at the local cafe; the hostile and unapproachable Nettie, the effervescent and chatty Kathy, the compassionate pastor of the Baptist church, and a host of other colorful “locals.” Bonnie is hoping to receive love and acceptance, but as she helps uncover some painful truths around town, she discovers home is where the heart is. McDonald said the writing process, paired with the faith-based theme of the book, changed her life more than she expected. McDonald will be at the Macon County Public Library on Saturday, Sept. 16, from 10 a.m. to 12:30 p.m. for a book signing. Pam McDonald and her husband Dave moved to Franklin almost 11 years ago from Winter Garden, Fla. They grew up in Cocoa, Fla., and graduated Cocoa High School as sweethearts. The pair married and moved to Orlando where they were part of the opening cast members at Walt Disney World, before the park opened. Together they have two children, Tony, who lives with his wife, Becky, and three children in Lexington, Ky. Their daughter, Tina, lives in Franklin with her husband, Brian, and two children. The family owns a carpet cleaning and mold/water damage restoration company. Franklin, NC—Tyler Cook, Franklin native, Western Carolina University alumnus and author, will release his fourth book, ‘Vigilante’, at a special release party on March 4 at 9 a.m. at the Macon County Public Library. It’s been a year since Aluria appeared as the hero of Canton. He’s become a myth to many, a hero to some, and a threat to others. Among those who think he is an outlaw are those working at the Major Case Squad, who fear he will go too far and become the villain the vigilante hopes to rid the city of. This fear escalates when people are found murdered with a blade shaped like Aluria’s insignia. Could this new hero really be to blame, and if not, can he clear his name and find the person who is behind everything? ‘Aluria’, released in 2016, has been named the #1 bestselling superhero on Amazon.com multiple times, as well as reaching their overall bestseller list. Cook says he had the new story line in mind at the beginning of the series, and he can’t wait for readers to read it. For more information, contact Tyler Cook at moonshinepressnc@gmail.com or visit www.tylermcook.com. Franklin, NC—Deanna Lawrence, two-time Emmy winner and Franklin resident, has released her memoir and first book, Sometimes…A Storyteller’s Journal. “As a storyteller for more than three decades, it is an honor to share some of the life experiences I had as a television journalist,” said Lawrence. Sometimes…is a personal sharing of the “stories behind the stories.” The veteran TV news reporter learned about people and about life over the many years she spent on the reporting beat. Lawrence has served as journalist, anchor, producer and photographer, with more than thirty years at WTVT Ch. 13 in Tampa, Florida. A graduate of Northwestern University, Deanna is an award-winning storyteller. Among her accolades, she was honored with international, national and regional awards, including two regional Emmys, the Associated Press Award of Excellence and the International New York Film Festival Silver Medal. “I hope those who read this book, gain a better understanding of what it truly means to be a storyteller, and a real appreciation of the stories behind the stories,” said Lawrence. Copies of Lawrence’s book can be found on Amazon, Barnes and Noble, Kobo, and in local bookstores. For more information, contact Tyler Cook, Lawrence’s publicist at moonshinepressnc@gmail.com. Dillsboro–Western Carolina University communication and public relations students will release a new book, “A Guide to Historic Dillsboro,” in celebration of the town’s 125th anniversary during Dillsboro’s Heritage Day event on Saturday, Sept. 6. Students Tyler Cook, Michael Lovett and Susan Shelton developed the book as part of a Public Relations Campaigns course taught in spring 2014 by Dr. Betty Farmer, professor of communication and public relations. Farmer has led WCU’s community engagement project in Dillsboro since 2009. With the help of Farmer, the authors added content and edited the book during the summer. “We look forward to sharing the story of Dillsboro with the larger community,” said Cook, now a WCU alumnus, who, in addition to contributing a significant amount of content, did the layout for the book as well as served as production manager during the printing process. Cook is co-founder, with local author Eva McCall, of Moonshine Press, a Franklin-based publisher. The authors will be available to sign copies of the book during the Heritage Day event, which is scheduled from 10 a.m. to 4 p.m. in downtown Dillsboro. Additionally, the book will be sold in Dillsboro stores, local bookstores and online. All proceeds from the book will be donated to the Appalachian Women’s Museum. The authors especially thank Dogwood Crafters, which sponsored the initial printing costs of the book. A craft cooperative in business since 1976, Dogwood Crafters showcases the handmade treasures of regional artisans. 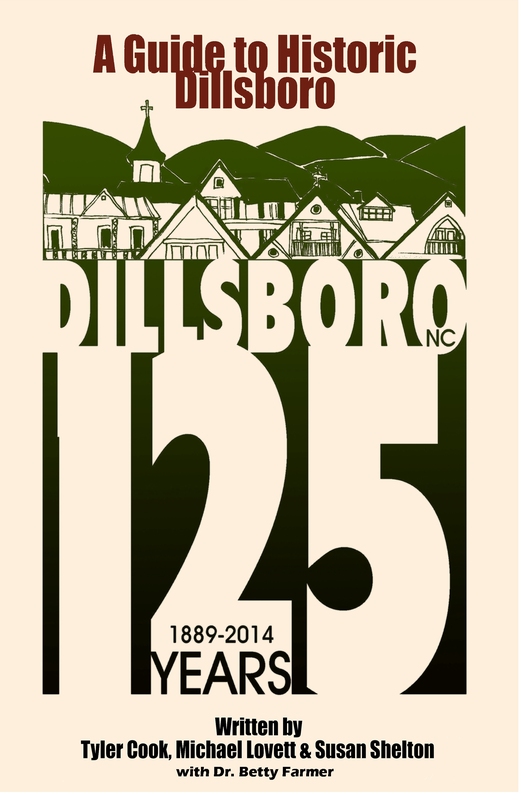 A Guide to Historic Dillsboro is a project of the Dillsboro/Western Carolina University Partnership Committee. This book is in celebration of both Dillsboro’s and WCU’s 125th anniversaries. For more information, contact Cook, co-author and Moonshine Press publisher, at 828.371.8519 or moonshinepressnc@gmail.com. Timm Muth, local author, released his debut novel, “Disciple of the Flames”, on July 15, 2014. The book follows the tale of Darn, a young herdsman’s son, who is inducted into a religious/military order known as the Disciples of the Flames. The Order’s members follow a strict code of martial training and personal honor. Possessing near-superhuman fighting skills, these renowned warriors are respected and feared across the land. The Disciples’ teachings bring Darn strength and security, the very things his life had always lacked. But as he begins to discover, the price for such mastery may be as high as the cost of his humanity. Muth will be touring the region to promote his new novel. His first book signing will be on Saturday Aug. 30 at 3:00 P.M. at City Lights Bookstore in Sylva, N.C. The novel is currently available online and at local libraries, and will soon be in local bookstores. A free sample of the book is posted on the author’s website, TimmMuth.com, along with a link for purchasing a copy. In early 2000, Muth authored the well-known trail guide, “Mountain Biking North Carolina”, by Falcon Press. And it was their love of playing in the mountains that brought Timm and his family to live in Jackson County in 2003. Timm is currently working on the sequel to “Disciple of the Flames”. For more information, contact Tyler Cook, Moonshine Press publisher at moonshinepressnc@gmail.com.